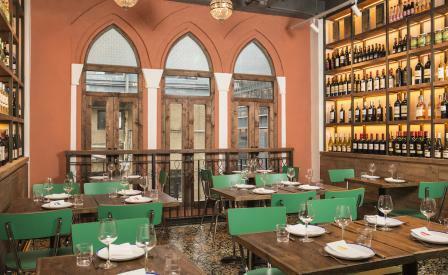 No one’s about to mistake the crowded streets of Hong Kong’s Soho for bright, breezy Beirut, but Maison Libanaise has certainly injected the neighbourhood with some much-needed colour. The exterior of the three-story venue, another creation of local culinary trendsetters Black Sheep Restaurants, is covered in a striking mural of a woman swathed in traditional Arabic motifs. On the inside Black Sheep’s design team has adorned staircases and walls with vibrant geometric patterns and sprawling paintings inspired by vintage airline posters, rendering Levantine wonders in sunny pastels. Simple wooden furniture, dangling lights and arched windows contribute to a convincing evocation of the salons of Beirut’s cosmopolitan 1960s-era heyday. Maison is roughly split into a street-level takeout area, first-floor dining room and canopy-covered roof terrace, but the cuisine -- and the focus on wines from an impressive range of Lebanese vineyards -- is consistent throughout. Lead chef James Harrison, a protégé of Michelin-starred Lebanese-Australian chef Greg Malouf, hews closely to Lebanese home cooking in the execution of falafel, grilled haloumi and other standards, with an emphasis on fresh ingredients and the breads, dips and sauces made on-site. In a city where new restaurants frequently tread old or well-established ground, Maison Libanaise is a genuine standout and proof that 12 properties in, Black Sheep has yet to run out of conceptual steam.